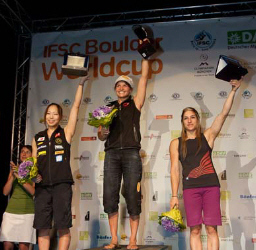 After a brief hiatus the 2011 Bouldering World Cup circuit held its final event in Munich, Germany over the weekend. Russians dominated the men’s event with Dimitry Sharafutdinov flashing all four problems followed by fellow countrymen Rustam Gelmanov and Alexey Rubstov finishing in 2nd and 3rd respectively. For the women it was Slovenia’s Mina Markovic who topped out three boulders to take the win. Going into the event Kilian Fishhuber had already locked up his 5th overall title while Anna Stöhr and Akiyo Noguchi were separated by a mere five points. In the end it was Stöhr who would take the overall title on the strength of her 3rd place finish in Munich while Noguchi’s 6th place finish was good enough to hold on to 2nd overall. American Alex Puccio completed her first full season on the World Cup circuit with an 8th place finish in Munich. This finish, along with a consistent performance throughout the season that saw her make finals in 7 out of the 9 events, solidified her 3rd place standing in the overall rankings and put an American on the podium for the first time ever. For some media from the event check out this post on the Spot’s blog which breaks down a few of the problems in finals and then there is this photo gallery by Marco Kost at Urban Climber.